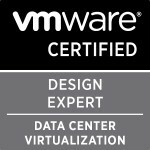 I just wanted to repost this just in case people don’t follow the VMware SMB blog page. The below blog posting was posted by me on this blog over a week ago (I’m very busy at work doing cool vRealize Automation stuff which I hope to blog about very soon) . Hopefully this is of interest to a number of people and so keep an eye for my future blog posting via the SMB blog. In recent years, virtualization has dramatically changed the infrastructure of companies and helped them to consolidate and optimize their environments. With the change and growth of the VMware vSphere® family of products, a number of features and solutions that were only part of the Enterprise and Enterprise plus licencing packages are now available for the small and midsize business (SMB) market as well. This change is causing SMB customers to rethink and re-evaluate their vSphere virtualized infrastructure to leverage these new offerings and realize the benefits of advanced reporting, data protection, enhanced optimization and advanced service offerings, to name a few. As a senior consultant doing work as a VMware partner and as an extension of VMware PSO, this change is something I am evangelising and explaining to all my customers. I especially want the small and midsize businesses I work with to know the capabilities and solutions that are now available at no extra cost to them, which can help enhance and optimize their virtualized infrastructure. A large portion of these successes have been through the ability of SMB customers to now utilize vSphere with Operations Management to do reporting, monitoring and future planning through smart alerts, built in reports and health dashboards designed to optimize the utilization of hardware resources, such as CPU, memory and storage. As shown in the screenshot below, this dashboard enables SMB customers to monitor the state of the environment through the current health score, the potential risks to the environment, the future health of the environment and how well the environment is running through the efficiency score. Each of these scores can be expanded to give further information and methods to improve these rankings. I always like to explain these scores like the the health of a person – the higher your health score is, the healthier you are, and the higher your risk factors, the bigger the chance of your health being impacted. Your efficiency is how well you are doing things and how you could do things better. 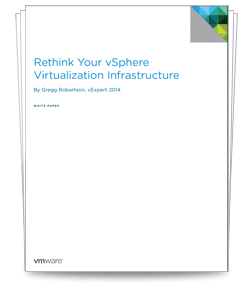 I’ve written a whitepaper around the need for SMBs to rethink their virtualization infrastructure and to elaborate on a number of the features and solutions that are now available to SMB customers, like vRealize Operations built into vSphere with Operations Management, as briefly detailed above. Download the whitepaper to learn how these solutions can help your business and your customers. If you require any more information or consultancy about the solutions and technologies covered in the whitepaper, then please don’t hesitate to contact VMware Professional Services. Categories: Automation, SMB, Virtualisation, VMware | Tags: SMB, Virtualisation, virtualization, VMware, vSphere | Permalink.